Andy Tonthat was born on O‘ahu and raised on Maui. He is currently a student at UH Manoa, where he is majoring in Computer Science and plans to graduate in Spring 2015. 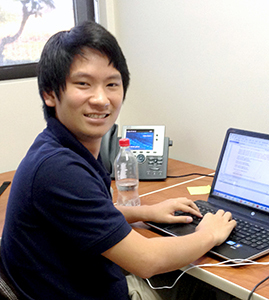 After graduating, Andy would like to pursue a career in software engineering or to attend graduate school. In his free time, he enjoys playing tennis and video games. Project Abstract: The Pacific Joint Information Technology Center (JITC) Integrated Test and Evaluation Center (ITEC) hosts developmental “sandboxes” — isolated environments in which customers can test new software, without the risk of adverse effects to existing systems. There are four parts to the creation of developmental sandboxes: hosting of disk space, creation of virtual machines on disk, configuration of the virtual machines, and the creation of users and directories. Currently, this process requires many manual executions, and therefore takes a considerable amount of time to complete. In order to automate the setup of these sandboxes, we created scripts that will execute these commands with little or no manual interaction. This is done through the combined programming languages of Powershell, which is used to run high-level programming such as the creation of users and virtual machines, and C#/ASP.Net, which is used to host all of the scripts and execute all of the commands in order. Currently, the automation process can execute the steps of the creation of sandboxes individually; however, the commands are not yet linked together. Future work will combine the automated executions of the commands, and error checking will also be implemented in order to improve usability.